With Heart’s Day on the 16th, Suns Dawn is a special time in Tamriel, and if you happen to participate in the month’s cross-cultural celebration of camaraderie, there’s no better time to show your appreciation for those who make up your ESO community. Note: NOT 1000 Crowns per gift, but 1000 Crowns total. Two individual gifts that are valued at 500 Crowns each would count, as would three gifts each valued at 400 Crowns. However, if you sent a gift worth 500 Crowns on the PC NA server and another worth 500 Crowns on the Xbox One NA server, it would not count. The Pink Pearl Pig doesn’t want food, she wants love. 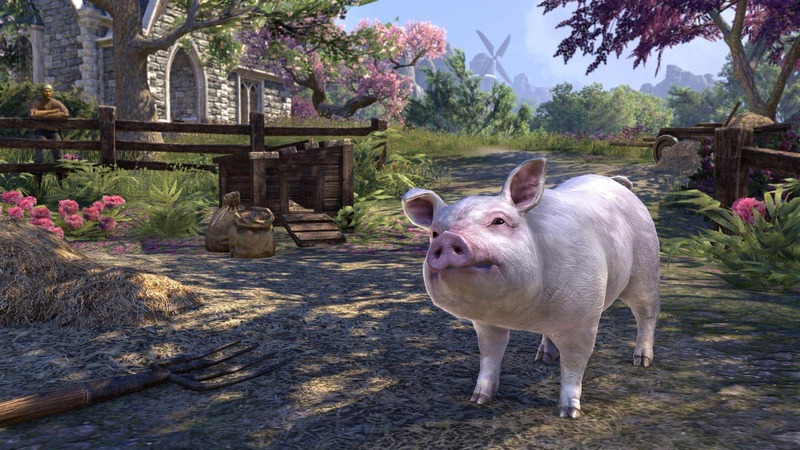 Unlike the Snowcap Fledgling Griffin pet from the December Gifting promotion, the Pink Pearl Pig pet is exclusive to this promotion and will NOT be available in the Crown Store at any point in the future. If you want this precious piglet, you’ll need to send some gifts! To send your friend a gift, navigate to the item you wish to buy in the Crown Store and select the “Purchase as Gift" option, then enter their UserID, Gamertag, or PSN ID, depending on your platform. You can then personalize your gift with a custom-made or a pre-selected message. Note that homes cannot be gifted. You can check out all the currently available items, including pets, mounts, costumes, and more on our Crown Store page or in game, and you can stock up on Crowns right now via our Buy Crowns page. This promotion has already begun and will run until March 1, 2019 at 2:00AM EST. Don’t miss out on your chance to both share the love during Suns Dawn AND receive this Heart’s Day hammie! Are you planning to gift your friends and guild mates this month? Let us know how you’ll be celebrating Heart’s Day in Tamriel via Twitter @TESOnline, Instagram, or Facebook.